Thanks to its stunning sail and its crocodile-like appearance and lifestyle—not to mention its romping, stomping cameo in Jurassic Park III—Spinosaurus is rapidly gaining on Tyrannosaurus Rex as the world's most popular meat-eating dinosaur. 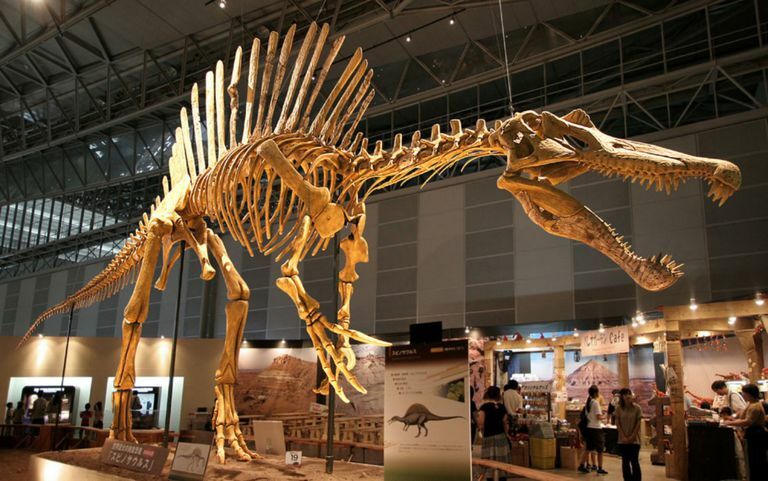 Below you'll discover 10 fascinating facts about Spinosaurus, ranging from its ten-ton size to the various types of sharp teeth embedded in its elongated snout. Spinosaurus is the current record-holder in the world's largest carnivorous dinosaur category: full-grown, 10-ton adults outweighed Tyrannosaurus Rex by about a ton and Giganotosaurus by about half a ton (although paleontologists speculate that certain Giganotosaurus individuals may have had a slight edge). Since so few Spinosaurus specimens are extant, it's possible that other individuals were even larger—but pending further fossil discoveries, we can't know for sure. In late 2014, researchers made a stunning announcement: Spinosaurus pursued a semiaquatic lifestyle, and may have spent more time submerged in the rivers of its northern African habitat than it did stomping around on dry land. The evidence: the positioning of Spinosaurus' nostrils (toward the middle, rather than the end, of its snout); this dinosaur's small pelvis and short hind legs; the loosely connected vertebrae in its tail; and various other anatomical quirks. Spinosaurus almost certainly wasn't the only swimming dinosaur, but it's the first one for which we have convincing evidence! The sail of Spinosaurus (the exact function of which is still a mystery) wasn't simply a flat, oversized outgrowth of skin that flopped wildly in the Cretaceous breeze and got tangled in dense underbrush. This structure grew on a scaffold of scary-looking "neural spines," long, thin projections of bone—some of which attained lengths of nearly six feet—that were attached to the vertebrae constituting this dinosaur's backbone. These spines aren't just hypothesized; they have been preserved in fossil specimens. As befitting its semiaquatic lifestyle (see above), the snout of Spinosaurus was long, narrow and distinctly crocodilian in profile, studded with relatively short (but still sharp) teeth that could easily pluck wriggling fish and marine reptiles out of the water. From back to front, this dinosaur's skull measured a whopping six feet in length, meaning a hungry, half-submerged Spinosaurus could take a sizable bite out of any time-traveling humans in its immediate vicinity, or even swallow small ones whole. Spinosaurus shared its northern African habitat with Sarcosuchus, aka the "SuperCroc"—a 40-foot-long, 10-ton prehistoric crocodile. Since Spinosaurus fed mostly on fish, and Sarcosuchus spent most of its time half-submerged in water, these two mega-predators must have occasionally crossed paths by accident, and may even have actively targeted one another when they were especially hungry. As to which beast would emerge the winner, well, that would have been decided on an encounter-by-encounter basis. The German paleontologist Ernst Stromer von Reichenbach discovered the remains of Spinosaurus in Egypt shortly before World War I—and these bones wound up in the Deutsches Museum in Munich, where they were destroyed by an Allied bombing raid in 1944. Since then, experts have mostly had to content themselves with plaster casts of the original Spinosaurus specimen, since additional fossils have been frustratingly scarce on the ground. Nearly 200 million years before Spinosaurus, Dimetrodon (not technically a dinosaur, but a type of synapsid reptile known as a pelycosaur) sported a distinctive sail along its back. And a close contemporary of Spinosaurus was the north African Ouranosaurus, a hadrosaur (duck-billed dinosaur) equipped with either a true sail or a thick, fatty hump of tissue that it used to store fats and liquids (like a modern camel). Even if the sail of Spinosaurus wasn't unique, though, it was certainly the largest such structure of the Mesozoic Era. Judging by the size of its front —which were much longer than those of a comparably sized Tyrannosaurus Rex—some paleontologists believe that Spinosaurus occasionally walked on all fours when it wasn't in the water, which would be very rare behavior indeed for a theropod dinosaur. Combined with its piscivorous (fish-eating) diet, this would make Spinosaurus the Mesozoic mirror-image of contemporary grizzly bears, which are mostly quadrupedal but invariably rear up on their hind legs when threatened or upset. Suchomimus ("crocodile mimic") and Irritator (so named because the paleontologist examining its type fossil was frustrated that it had been tampered with) both resembled a vastly scaled-down Spinosaurus. In particular, the long, narrow, crocodile-like shape of these theropods' jaws hint that they inhabited similar fish-eating niches in their local ecosystems, the first dinosaur (Suchomimus) in Africa and the second (Irritator) in South America; whether they were alsoactive swimmers remains unknown. Further complicating our picture of the semiaquatic, crocodile-like Spinosaurus is the fact that this dinosaur had a complicated assortment of teeth: two giant canines jutting out of its front upper jaw, a few bigger ones set further back in the snout, and a variety of straight, conical, grinding teeth in between. Most likely, this was a reflection of Spinosaurus' varied diet, which included not only fish but occasional servings of birds, mammals, and possibly even other dinosaurs.